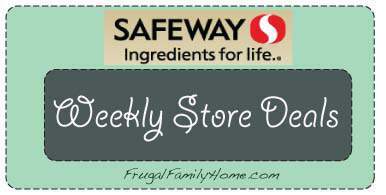 Here are the deals that look good to me this week at Safeway. Disclosure: Some of these links are my referral links. The ads are different in different states. We have a pint of raspberries for 99c, grape tomatoes for 99c container, bananas 57c lb. That is about it at that store. There are other really good deals at various stores that are close. Fry’s (Kroger) has local grown cantaloupe for 97c ea., hamburger buns 88c ea pkg., 1/2 gal milk 88c, dozen large eggs 88c. I went to Fred Meyer (kroger store) to get some pineapple for $1 each but they were sold out the day I went. I will try later this week again. I really like to dehydrate it and freeze some too. I know each state has different sales it seems, probably because different things are in season at different times. I am hoping for some good berry deals soon here. My mom lives in Oregon and went to a local berry stand and paid $1.00 for a pint of strawberries. Just saying. Sometimes if the stores have local produce and fruit you can get it as cheap or cheaper than driving to the country. That is a good deal I am hoping to get strawberries this weekend to make some strawberry jam with before the rain starts again next week. We also live in Oregon.